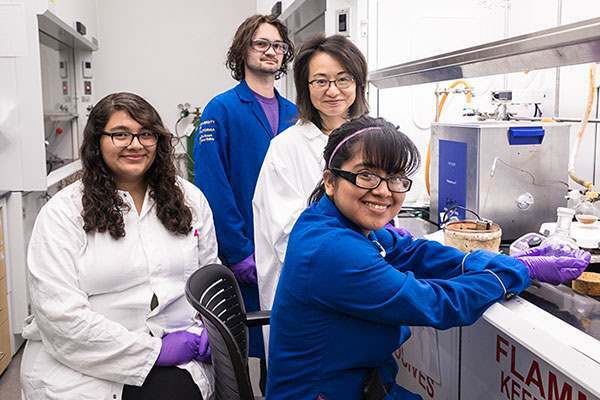 A growing university, UC Merced is home to an increasing roster of research centers delving into a wide array of topics, from nanomaterials and climate communication to better teaching methods and community partnerships. By forging the newest branch of the Blum Center for Developing Economies, UC Merced has a unique opportunity to help the San Joaquin Valley as it evolves coming out of the recession. Like all of UC Merced’s centers and institutes, the Blum Center features interdisciplinary research and projects, and includes affiliates from other UC campuses. Research and education initiatives are faculty-led, and many involve the community. UC Merced’s theme is “Global California: The World at Home, and at Home in the World.” The center concentrates on three facets of the region’s economic challenges: engaging communities and the region in their own long-term success; taking environmentally, economically, and socially sound approaches to growing prosperity; and using scientific measures to ensure that our activities actually improve quality of life. Merced Nanomaterials Center for Energy and Sensing (MACES) was founded in 2015 through a $5 million grant from NASA. The center promotes innovative and collaborative research in functional nanomaterials for energy and sensing for NASA missions, while simultaneously addressing terrestrial needs for early disease diagnosis and for clean and renewable energy. The center also aims to increase participation of underrepresented and underprivileged undergraduate and graduate students, educating a new generation of STEM workforce trained in a multidisciplinary material research environment with solid foundations and excellent problem-solving skills. CREST Center for Cellular and Biomolecular Machines (CCBM) was established with a $5 million grant from the National Science Foundation and brings together more than a dozen faculty members from multiple units across campus, including bioengineering, physics, chemistry and chemical biology, materials science and engineering. Researchers are studying how biological matter like proteins or cells come together to perform specific tasks, in hopes of eventually being able to engineer and develop innovations ranging from designer cells and tissue to novel diagnostic and therapeutic devices. The CCBM also hosts an integrated, interdisciplinary training program for graduate students that emphasizes physical and biological components and research and training experiences for undergraduate and high school students to enhance the recruitment of underrepresented minorities into STEM research. The Center for Climate Communication conducts and promotes research on communicating climate issues, including climate variability and adaptation. Researchers examine the meaning and presentation of climate reports from varied sources; study how the content and mode of presenting climate information influences how the general public reasons about uncertainty and risk; work with varied stakeholders to develop better ways to talk about and think about climate issues; and host and participate in outreach and educational activities. The Center for Computational Biology is a research and education center sponsoring multidisciplinary scientific projects in which biological understanding is guided by computational modeling. The center helps develop and distribute course materials based on the latest research in computational biology; hosts multidisciplinary research projects in computational and mathematical biology; and develops new mathematical and computational methods that are widely applicable to predictive modeling in the life sciences. The Center for Early Cognition and Language investigates how children between 1 and 4 years old become part of their social world. Studies include learning how children make sense of other people's actions and emotions; whether they understand that other people have goals and preferences; how children learn language and figure out the meanings of words; and how their understanding of words changes over time. The Center for Educational Partnerships has existed since before the campus was even built to provide a single, comprehensive departmental home for all programs and services related to student academic preparation and educational partnerships. The center was established to contribute to long-range improvement in the education of San Joaquin Valley students and ultimately, to increase the number of area students eligible to attend institutions of higher education. The Center of Excellence on Health Disparities is a research cluster of the Health Sciences Research Institute. Its goals are to increase the number of students who are knowledgeable about health disparities; improve the numbers of students from under-represented and disadvantaged groups performing research in health disparities; and expand the capacity and competence of UC Merced in conducting health sciences research that address health disparities in the region. The Center for the Humanities is committed to stimulating individual and collaborative research and scholarly work that explores both human experience and human consciousness, as well as the cultural products — art, literature, music, material and culture — that record reflect and express them. The center supports the exchange of intellectual and creative ideas and activities among faculty, students, and the broader regional community through forums, lectures, seminars, exhibits and films. The Center for Engaged Teaching and Learning advocates a union of scholarship and instruction, grounded in the academic principles of research and focused on supporting the success of UC Merced’s diverse student population in a research university context. To enable students to excel academically, the center supports a campuswide culture that values, fosters, and rewards continuous improvement in teaching and learning. 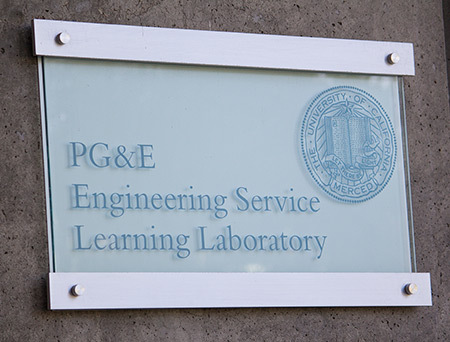 The Foster Family Center for Engineering Service Learning focuses on experiential learning among interdisciplinary, diverse student teams and their UC Merced faculty mentors. Students work with nonprofit community partners on specific business challenges; attend Skill Sessions; participate in the annual Innovate to Grow competition; and work on their team projects. They get valuable experience in teamwork and in developing lasting and practical solutions individually tailored to their partners' needs. The Resource Center for Community Engaged Scholarship at UC Merced connects community members with UC Merced students, faculty members and staff members so they can work on common research goals. ReCCES helps address important community concerns, as well as helps people improve their grant-writing skills, build relationships and networks that will help them succeed, better support their goals with evidence-based research and learn to promote the value of research within their organizations. The Spatial Analysis and Research Center (SpARC) is the hub for spatial science research, analysis, education, visualization, spatial data archiving, and access to spatial science software and equipment for UC Merced and its partners. SpARC leads faculty and community partner grants for research and other activities with spatial aspects, and collaborates on ongoing projects. SpARC seeks ways to expand undergraduate curriculum in geography and spatial sciences. The STEM Resource Center is building a learning community to enhance academic and social experiences for undergraduates pursuing degrees in science, technology, engineering and math. Center staff members work with students individually to help them flourish in intellectual endeavors and take personal responsibility for their own successes. They support students in finding research and internship opportunities and building lifelong skills needed for advancement and leadership in STEM careers. The Small Business Development Center is part of the Central California SBDC Network, providing entrepreneurs and small businesses with high-quality education, consulting, support for innovation, access to information and tools necessary to build successful sustainable businesses. The UC Merced SBDC Regional Network assists Central California's entrepreneurs and small business owners through one-on-one business consulting and research.